Q64. Do you think success can only be achieved through hard work and that luck has nothing to do with it? Argument: I think that luck has a part in success, too. Support 1: People cannot choose where they are born or what type of family they will be born into. Support 2: Some people are lucky in the sense that they are in the right place at the right time. Support 3: Some people are lucky enough to get good opportunities. 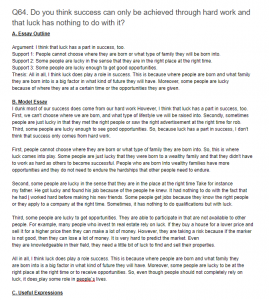 Thesis: All in all, I think luck does play a role in success. This is because where people are born and what family they are born into is a big factor in what kind of future they will have. Moreover, some people are lucky because of where they are at a certain time or the opportunities they are given. I dunk most of our success does come from our hard work However, I think that luck has a part in success, too. First, we can’t choose where we are born, and what type of lifestyle we will be raised into. Secondly, sometimes people are just lucky in that they met the right people or saw the right advertisement at the right time for rob. Third, some people are lucky enough to see good opportunities. So, because luck has a part in success, I don’t think that success only comes from hard work. First, people cannot choose where they are born or what type of family they are born into. So, this is where luck comes into play. Some people are just lucky that they were born to a wealthy family and that they didn’t have to work as hard as others to become successful. People who are born Into wealthy families have more opportunities and they do not need to endure the hardships that other people need to endure. Second, some people are lucky in the sense that they are in the place at the right time Take for instance my father. He got lucky and found his job because of the people he knew. It had nothing to do with the fact that he had l worked hard before making his new friends. Some people get jobs because they know the right people or they apply to a company at the right time. Sometimes, it has nothing to do qualifications but with luck. Third, some people are lucky to get opportunities. They are able to participate in that are not available to other people. For example, many people who invest tn real estate rely on luck. If they buy a house for a lower price and sell It for a higher price then they can make a lot of money. However, they are taking a risk because If the marker is not good, then they can lose a lot of money. It is very hard to predict the market. Even they are knowledgeable in their field, they need a little bit of luck to find and sell their properties. All in all, I think luck does play a role success. This is because where people are born and what family they are born into is a big factor in what kind of future they will have. Moreover, some people are lucky to be at the right place at the right time or to receive opportunities. So, even though people should not completely rely on luck, it does play some role in people`s lives.